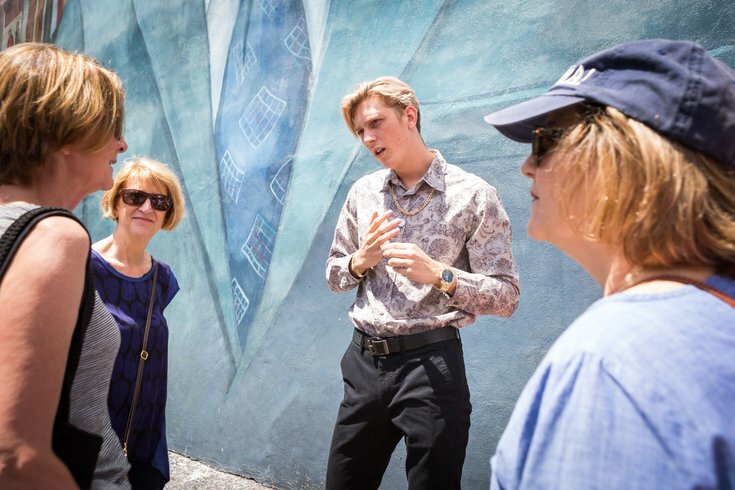 Nicholas Scheppard, who plays Antonio in the Italian Market Project, acts out a scene near the Frank Rizzo mural. When I asked Vince Fumo what his first show was about, it took him a few tries to give me a comprehensive answer. Actually, whenever I asked any of the creatives behind his show for a summary, they faltered. After seeing it for myself, I sympathize. It’s a tour, but it’s undeniably a play – a site-specific interactive theater experience, a participatory goose chase. It’s scripted. It has actors, a narrative, a director, a stage manager, costumes. But it’s set on the sidewalk and every show is different. “The Italian Market Project” is a new whatever-you-want-to-call-it set in South Philly — more specifically, up and down 9th Street in the Italian Market. The stage is the fruit and veggie market, inside Los Amigos Mexican, in a parking lot, an abandoned lot and alleyways around the neighborhood. 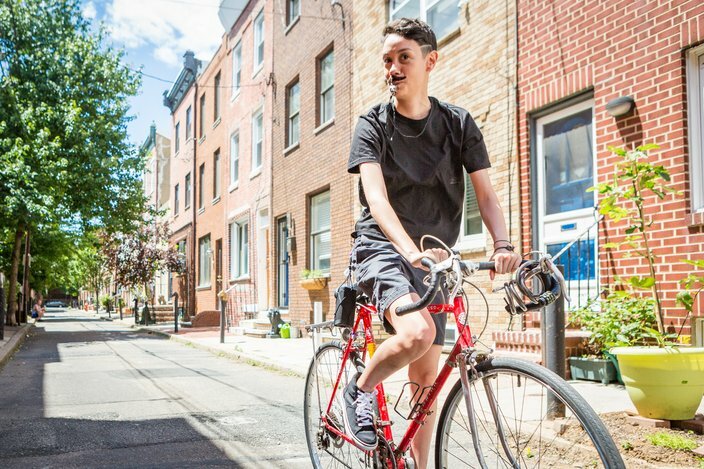 Fumo, the creator and leader behind his newly-formed theater troupe, Bicycle Thief Productions, has never done this. Here's a theater newbie, and you can tell. It’s unconventional, pretty wacky, the narrative is (at times) hard to follow. This is probably because attendees are simultaneously piecing together a puzzle, (literally) chasing after actors, dodging cars and looking for clues — all in a 90-minute run time. Nicholas Scheppard, right, and Adam Howard act out a scene near the Frank Rizzo mural in the production of The Italian Market Project. He jumped into the idea when, a few years back, he encountered a tourist in the neighborhood, cheesesteak in hand, who asked Fumo where else he should visit in the neighborhood. The original concept is for the tourist. But residents and business owners are on board too, Fumo said, which is evident in the show. The formation of Bicycle Thief Productions was intended to keep the show going for more than one season. “Ultimately, what we plan to do is turn it into a show that is always happening for people touring the market to always go see it,” he said. 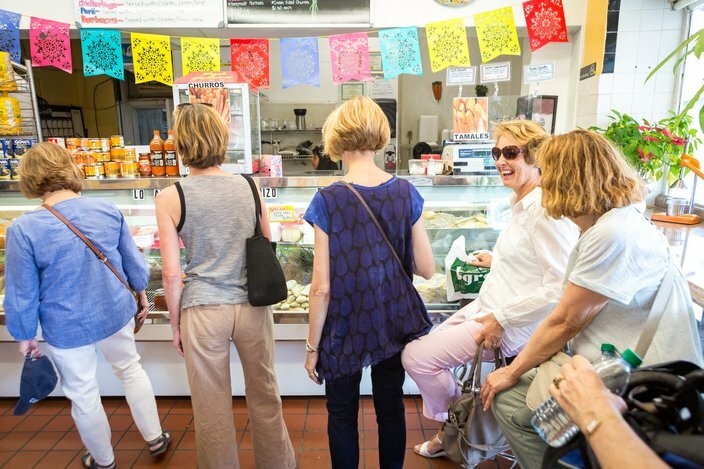 Attendees pick up a clue - and fresh hot tamales, from the Los Amigos Food Market as part of the production of The Italian Market Project. Fumo started work nearly two-and-a-half years ago on the project with the help of writer David Jacobi and director Michael Osinki who make this demanding, and quite ephemeral, play work. On the day I saw the show, I was joined by a group of ladies from the Philly chapter of the Transition Network, a group for women over 50 undergoing some sort of transition, most usually into retirement. We set off down 9th Street in search of characters and found ourselves in storefronts, alleyways, peering into windows. I started to give passersby the once-over to see if they were part of the show or not. But even if they technically weren’t, they were. Our group was often startled, uncomfortable and unsure of what to do next, which was both the beauty and the undertaking of seeing "The Italian Market Project." At one point, we were humming "The Godfather" theme song while looking at the Frank Rizzo mural. Fumo's actors are a small, young, excitable bunch. He said their side mission was to give young actors an opportunity to work in the summertime when not much is in season, so that in the fall, they can make a splash. Bianca Sanchez, who plays a thief, rides by with some stolen paraphernalia during The Italian Market Project production. A treasure of the show is Andy Hills, who, that day, was played by actor Adam Howard, one of the more scatterbrained characters who became our group’s pseudo tour guide for the day. Eventually, the ladies were talking to Howard about news they read in the paper and where we should stop for lunch after the show. We were just Philadelphians walking through the market. Howard in tow, we ate, we drank, we met some real-life Italian Market characters, some in-show actors, and each other. So, my advice if you want to take a chance on this show? It best suits a group of about eight to 10 attendees. Go with your friends, but break off from your group if you can. The official run-time is 90 minutes, but section off more of your day to this — you won’t want to rush out of there. You’ll be walking for most of the show. Don’t be afraid to ask questions and participate. The actors need you just as much as we need them. "The Italian Market Project" runs every weekend through July 1 on Friday at 2 p.m. and Saturday and Sunday at 12:30 and 3 p.m. You can get your tickets here and follow Bicycle Thief Productions on Instagram.